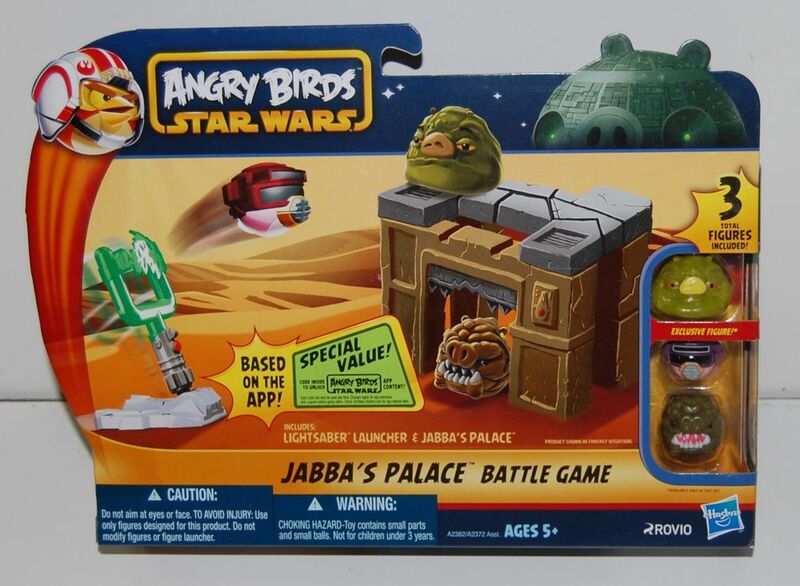 I posted about the Angry Birds Star Wars “Tatooine Battle Game” a couple of days ago. That set included Jabba, the Rancor and Jedi Luke (with a Millennium Falcon launcher), while this one has Jabba, the Rancor and Leia as Boushh (with Jedi Luke’s lightsaber as the launcher). At the time I said that I wasn’t sure why they really needed two very similar sets that included Jabba the Hutt and the Rancor, and I’m still a little fuzzy about that, but I do have some more information about how they differ now that I have this set in hand. Even though both versions are called “Battle Games,” it seems like this one is supposed to be more of a playset than a game. You just set up the blocks and try to knock them down. There doesn’t seem to be any set way that you’re supposed to build the “palace” either — the instructions, the front of the box, and the back of the box all show slightly different configurations. One other difference is that unlike the “Jenga” set, it’s not really possible to store the pieces for this set back in the box — at least not without some serious effort. This set claims that the Jabba the Hutt figure is an “exclusive” that’s only available in this set, which seems weird considering that we got a Jabba with the “Tatooine Battle” set. However, if you look at them closely you will see that the Jabba and Rancor figures that come with the sets are actually slightly different. My hunch is that the Jabba that comes with this set is meant to be part of the series that will be available for sale in blind packs of two figures, while the figures from the “Jenga” set are sort of considered to be separate. The “Jabba’s Palace” version (on the left) is clearly a different color and is also slightly smaller than the one from the other set (on the right). They also have different bottoms, and this difference extends to the Rancor figures from both sets as well. However, the Rancors appear to be the same size and are more or less the same color (maybe very slightly different). I’m not all that impressed with this set, since without any sort of game element it seems like it would get old pretty quickly. When I compare the two sets that come with Jabba, I almost get the feeling that they were two competing designs for the same product, but somehow they both ended up getting made. For me, the main appeal of Angry Birds Star Wars will probably be the app (and this set comes with a mysterious code to unlock some sort of bonus content in the app). But I also like the little figures pretty well, and may end up just collecting those. 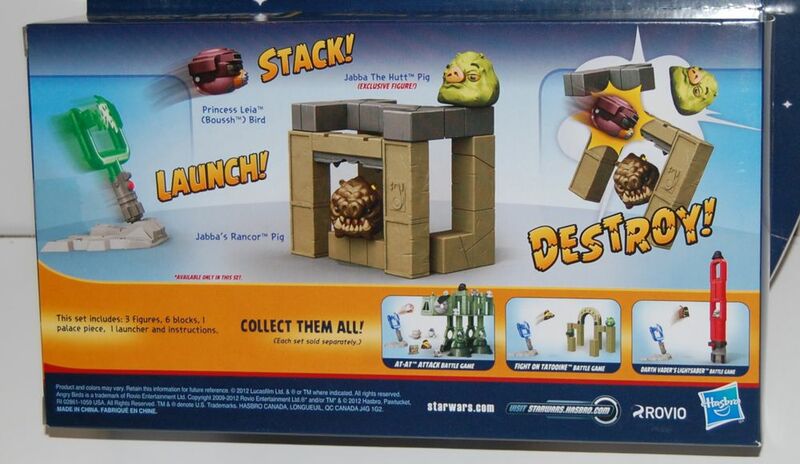 I’m hoping there will be more Jabba-related characters so I can use the blocks to set up a little palace scene.